It's not often that catalog bedding gets me excited. 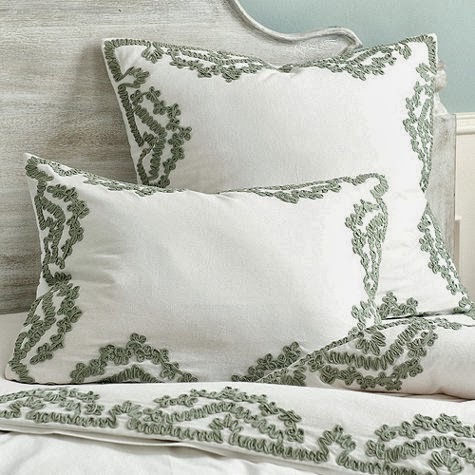 I find the matching sets to be overwhelming and I prefer simple beds dressed in mostly white or neutrals with pattern confined to a pillow or bedskirt. Love, love, love the hue of the applique. Looks to be somewhere between an aloe green and a blue-gray aqua. And I love how they've paired the duvet with the matelasse quilt. 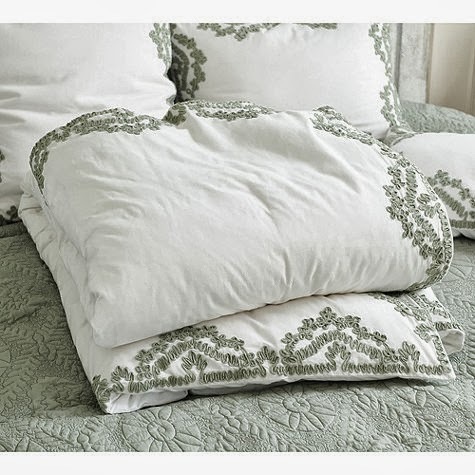 I would probably do the duvet with the euro shams and then do something else that coordinates for standard shams (or just use the sheets for the standard pillows). So pretty! I'm in need of some new bedding....decisions, decisions!! !